The word disciple is used most often in Greek philosophical circles to describe a committed follower of a master (such as Socrates). Jesus (Christ) of Nazareth had many such disciples, besides the 12 who became the apostles of the church. For example, Luke 6:13 hints at the existence of a larger circle of disciples: “And when it was day, he called his disciples, and chose from them 12, whom he named apostles.” Among the disciples who were not chosen as the 12 were women. This is noteworthy because few masters in the time of Jesus had female disciples. Beyond these disciples, many men and women were drawn to Jesus and followed him casually. The Gospels call them “crowds.” Jesus shared with the disciples thoughts that were kept from the crowds. For example, according to Mark, after Jesus had finished telling parables to the crowds, the disciples came to Jesus to learn their hidden meanings. The reason for this private tutoring was that the disciples were expected to develop ears and eyes to discern the true and deeper meaning of Jesus’ teachings. The 12 who were chosen, however, followed Jesus even more fully than the other disciples by leaving behind everything they had, including their jobs and families. The 12 were allowed to witness private details of Jesus’ life not available to the other disciples. For example, only the 12 were with Jesus on the night of his arrest. According to the synoptic Gospels and Acts, the names of the 12 were Simon Peter; James, son of Zebedee; John; Andrew; Philip; Bartholomew; Matthew; Thomas; James, son of Alphaeus; Thaddaeus (Judas); Simon the Cananaean; and Judas Iscariot, who betrayed Jesus. Unlike the other names, Simon Peter, Philip, and James, son of Alphaeus, consistently occupy the same positions (first, fifth, and ninth, respectively) on the list. 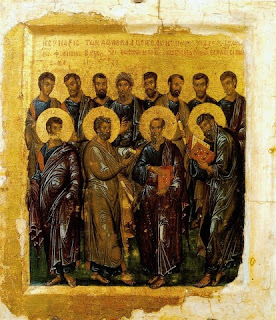 Based on this observation, it has been suggested that the 12 were organized into groups of four and that Peter, Philip, and James, son of Alphaeus, were their group leaders. This intriguing suggestion, however, has no hard evidence for support. As far as we know, the 12 were all from Galilee. Peter, Andrew, James, and John were fishermen, who, except perhaps Andrew, constituted the innermost circle of Jesus’ apostles. Simon Peter was the undisputed leader of the 12. Andrew was his brother and introduced him to Jesus. According to tradition, Andrew preached in Greece, Asia Minor (Turkey), and the areas north and northwest of the Black Sea. Tradition claims that he was martyred in Patras. A late tradition claims him to be the founder of the church of Constantinople, the seat of the Greek Church. James and John, sons of Zebedee, were also brothers. Possessors of a fiery temper and ambition, they asked Jesus to appoint them to sit at his left and right hand when his kingdom came. James (known also as James the Greater to distinguish him from James, son of Alphaeus) became the first of the apostles to be martyred under Herod Agrippa I. According to tradition, James had preached in Spain before meeting his untimely death in Jerusalem. As for John, tradition claims that he was the beloved disciple who wrote the Gospel of John, the three Epistles of John, and possibly also the book of Revelation. Tradition also claims that John, having survived a boiling cauldron of oil and banishment to Patmos under Emperor Domitian for preaching the Gospel in Asia Minor, died a natural death in Ephesus in the company of Mary, mother of Jesus. Modern critical scholarship rejects most of these claims. Philip is best remembered in the New Testament for introducing Nathaniel to Jesus and for asking Jesus to show him the Father. According to tradition, Philip’s ministry and martyrdom took place in Asia Minor. Not much is known about Bartholomew in the New Testament. According to tradition, he is the same person as Nathaniel in John 1:43–51, the man whom Jesus said was without guile. Tradition claims Bartholomew preached in Armenia and India, among other places. Thomas, known also as Didymus (Twin), is best remembered as the cynical doubter who wanted to touch the scars on the hands and the body of the resurrected Jesus. Thomas is a prominent figure in the Syriac culture and church, and according to tradition, he preached in India, where he was martyred. He is also credited with the Gospel of Thomas (reportedly of the Gnostics), which some scholars date to the middle of the first century c.e. Matthew was a tax collector who, according to ancient tradition, was the writer of the Gospel of Matthew. Many scholars reject this tradition, largely because of Matthew’s apparent literary dependence on Mark. The New Testament gives virtually no information about James, son of Alphaeus (known also as James the Lesser). James and Matthew would be brothers if Matthew is Levi who is also called son of Alphaeus in Mark 2:14. Tradition makes the questionable claim that James the Lesser was a cousin of Jesus. According to one tradition, he preached in Palestine and Egypt, but according to another, he preached in Persia. Thaddaeus (of Mark 3) is probably the same figure as Judas, son of James (of Luke 6 and Acts 1). Not much is known in the New Testament about this man. According to tradition, he preached in Armenia, Syria, and Persia. In some manuscripts, his name appears as Labbaeus. Simon the Cananaean is also called Simon the Zealot. It is unclear whether he was a militant type. According to some tradition, his missionary zeal took him to North Africa, Armenia, and possibly even Britain. Judas Iscariot, the treasurer for the 12, betrayed Jesus to the Jewish authorities who were seeking to kill him. According to Matthew, Judas hanged himself afterward from guilt. After the death of Jesus, Matthias, a man about whom nothing is known in the New Testament except the name, replaced Judas. According to Armenian tradition, however, Matthias evangelized Armenia alongside Andrew, Bartholomew, Thaddaeus, and Simon the Cananaean. The fact that the disciples of Jesus felt compelled to replace Judas Iscariot with Matthias to complete the number 12 seems to indicate that the 12 were believed to be the heads of a newly constituted Israel. Simon Peter is also referred to as Cephas in Paul and John. It is perhaps his unaffected humanity, accompanied by unrefined manners, that endeared him to Jesus and the rest of the group. He appears to have been the spokesman for the 12. For example, on the night Jesus was transfigured, he offered to build huts for Jesus as well as Elijah and Moses, who had come to visit Jesus. The leadership of the church, however, eventually appears to have gone to James, the brother of Jesus. According to ancient tradition, Peter went to Rome, which eventually became the seat of the Latin Church, and preached there and died a martyr, crucified upside down.